Amber Arcades, fronted by Dutch-born musician Annelotte De Graaf, shares their new ethereal track, ‘Wouldn’t Even Know’ featuring Bill Ryder-Jones. 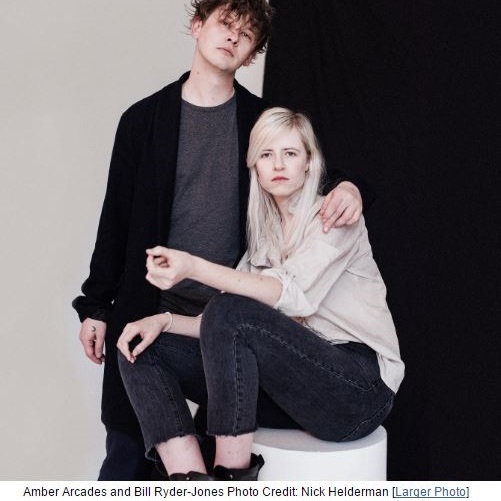 Bill Ryder-Jones said the following: “I was already a fan of Amber Arcades when I was asked to put a vocal on this. I’m quite jealous of Annelotte’s ability to find the right words to fit her melodies, it’s a rare thing these days. The song is beautiful”. The ‘Cannonball’ EP was recorded at Strange Weather Studio in New York whilst the band were on tour and is the follow-up to last year’s critically acclaimed debut album Fading Lines. The EP opens with Amber Arcades’ reworking of the classic Nick Drake song, ‘Which Will’ featuring her trademark ethereal, hazy, krautrock sound. The BBC 6 Music A-Listed ‘It Changes’ follows, which is possibly Amber Arcades’ most irresistible and compelling pop single to date. Then ‘Can’t Say That We Tried’ and the EP closes with the title track, the brand new and as-yet-unheard ‘Cannonball’. The artwork was designed by Nick Helderman who has photographed all of Amber Arcades’ artwork and photos to date. ‘Wouldn’t Even Know’ is taken from the upcoming five track ‘Cannonball’ EP which is set for release on 2nd June 2017. ‘Cannonball’ will be available on LP & Digital. Pre-order it HERE.